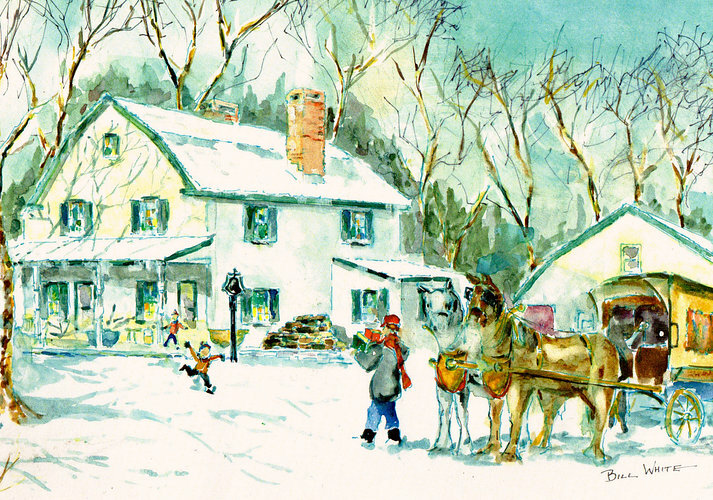 Watercolor Christmas card painted by Bill White in 2011. The view from the back, showing two additions. The laundry room is on the left; an office is on the right. After all the work we did on the porch, I have to confess we never use the front doors. We go in through the back. The house has been extensively renovated over the centuries. There is little left that is "old" visible. 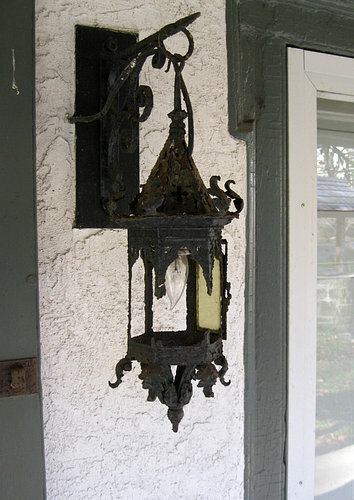 This ancient light fixture next to the stone house door still works. It has a single pane of glass left in it. Being electric, it was a later addition. 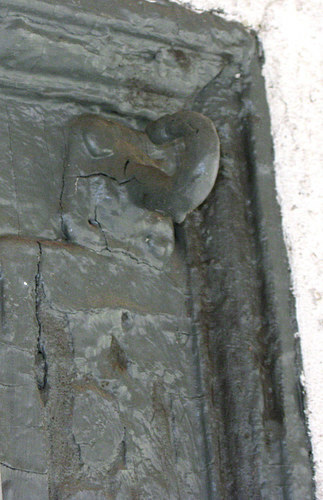 Old paint encrusted hook in the door jamb. A spike in the wall under the porch roof that predates the stucco. The spike is in the exact spot the hammock is shown hanging from in the drawing. 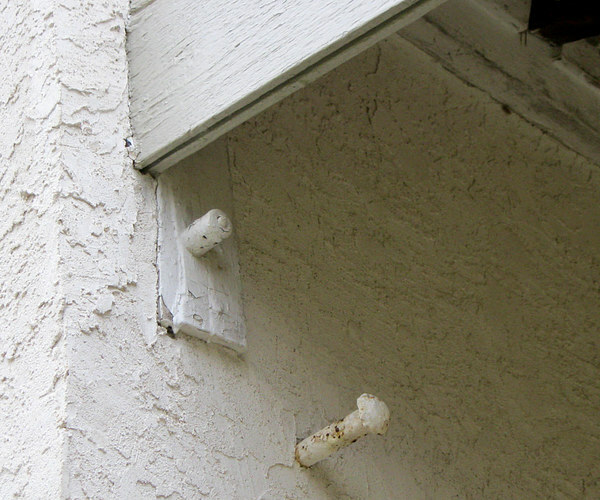 Except for some old shutter hinge pins, that's about it. Everything else is covered in stucco. Let's go down the basement! In the basement is found the "summer kitchen." This fireplace opening is over six feet wide. 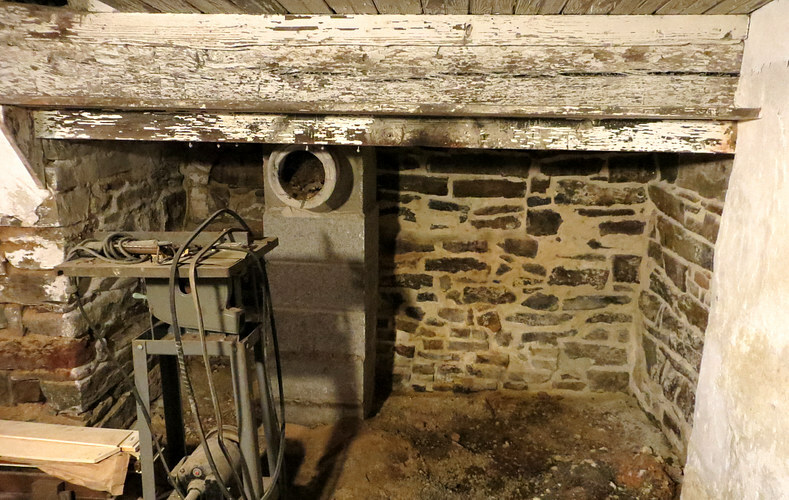 The stack of cinder blocks is the flue to an old boiler that used to heat the house. 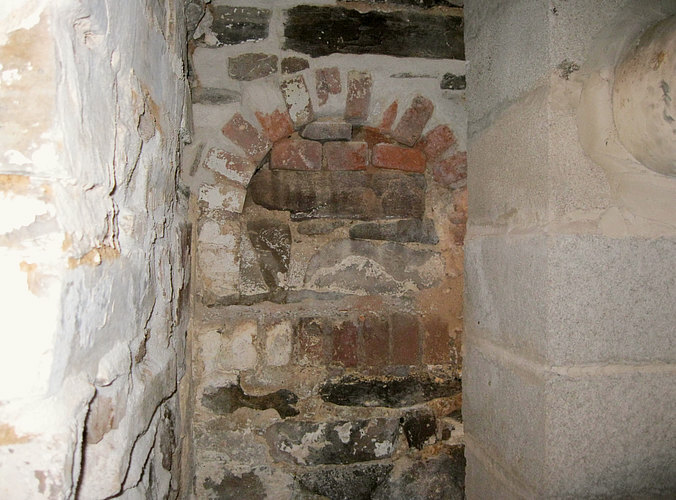 Inside the fireplace is an oven, now sealed with stone and brick. 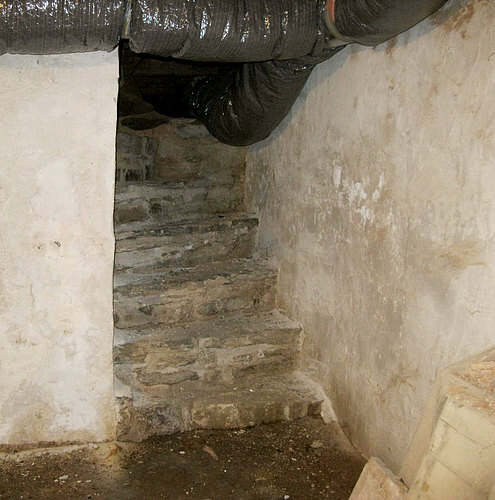 Andrea excavated this staircase, which had been buried. 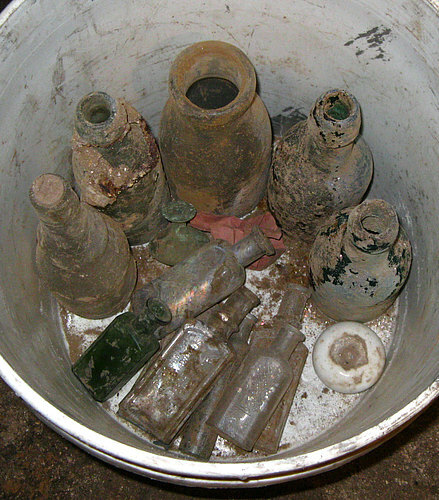 To the right is some of the loot she uncovered while removing the dirt. The staircase no longer opens to the first floor. Speaking of floor, the basement floor is dirt. 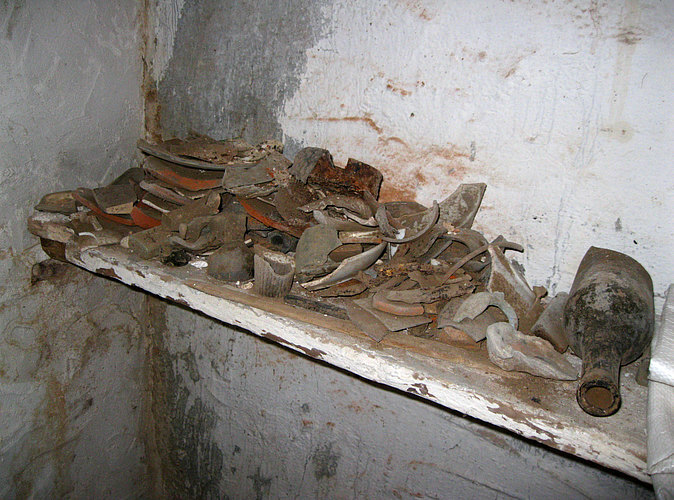 Old shelf covered with shards of glass and pottery that were found during the excavation. I can't help but wonder if Owen Evans or his family ever handled any of this stuff. We have some details about Owen and his family, thanks to Howard Jenkins and James A. Quinn, historian for Gwynedd Meeting. Owen and his son Samuel (who inherited the house) both listed themselves as "store-keeper" by occupation. Jenkins says the store was actually in the house. 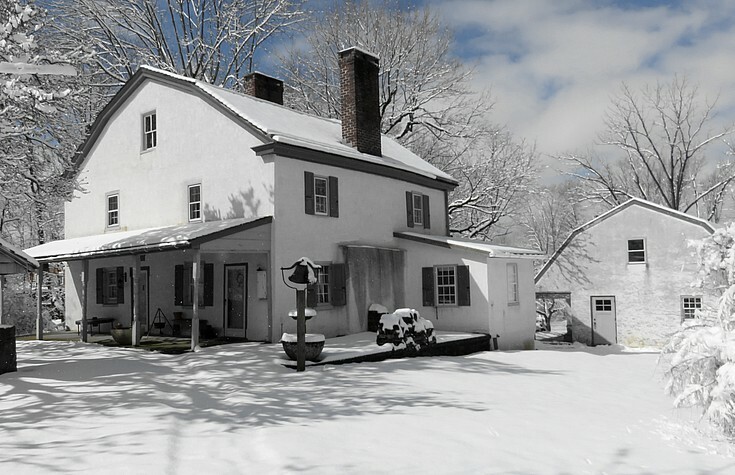 In the History of Montgomery County Pennsylvania, Illustrated, a sentence describing the general area reads, "A store was kept here by Owen Evans before 1765." Owen was also elected Justice of the County Court in 1726, and Samuel became a school teacher in North Wales, PA.
Owen Evans (1687 - 1757) married Ruth Miles (1693 - 1736) on January 3, 1715 (or 1716). They were married at the Radnor Meeting in Chester County, Pennsylvania. Ruth's sister was married to Evan Evans, Owen's cousin. Presumably, this is how Owen met Ruth. After Ruth died, Owen married Mary Nicholas, a preacher at Gwynedd Meeting. Rebecca 1745. Born during the diphtheria epidemic of that year. Died July 18. Owen Evans' will, made in 1757, mentions only Samuel, Amos and Margaret. Another bit of history of the house is that in June of 1778, as the British army was forced to leave Philadelphia, General Smallwood of the Continental Army had breakfast here with Caleb Foulke, who at that time owned the property. That much is written, but why would the General have breakfast with Caleb Foulke? The implication of the meeting is that the property was filled with the men, horses and equipment of Smallwood's army, and may have been for some time. An army needs food and water, this was a farm, and the well is in front of the house. During the nine months of the British occupation, the army stored many provisions in North Wales. Brigades of troops, supply wagons and horses were a common sight. Scouting and foraging parties were continually moving through the township. Generals, Majors and Colonels politely occupied the larger residences at times, while the common troops set up camp in the fields. There is no record of the role of the Meredith house, other than the breakfast with General Smallwood. However, the Gwynedd Friends Meeting house, just 1,500 feet away, was used as a hospital with 50 men posted there. It was attacked by the British on April 26, 1778 and 12 of our men were killed. The rest fled. Where did they go? It is safe to assume that more went on at Caleb Foulke's farm during the war than breakfast with the General. 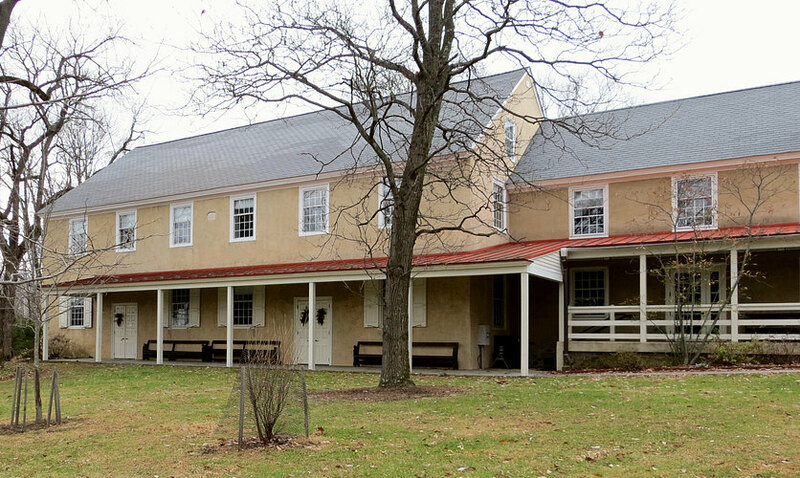 Across the road from the Meetinghouse was a "public house" now greatly enlarged and named the William Penn Inn. 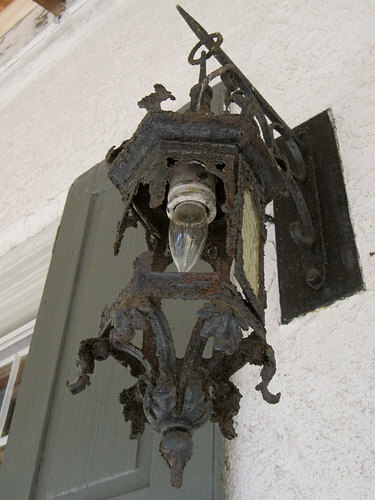 Behind the public house, in a small building that still exists to this day, was a blacksmith. The army made use of both. About 100 feet from the corner of the Caleb Foulk property (Sumneytown Pike and Swedesford Road) resided brigadier-general John Lacey in a tavern (today the building is an apartment). Lacey had at least 150 men with him. It should be pointed out here that the local population, being mostly Quakers, did not bear arms or join the military. For this they were fined for "failing to march or muster." Since they would not willingly pay the fines they had some of their property confiscated, so it seems they helped the cause of the Revolution, even if reluctantly. There were two companies in Gwynedd. The company in the lower part was commanded by Captain Dull in Springhouse and in the upper part by Captain Troxel. These were part of the Fourth Battalion of Philadelphia County Militia. All men of military age in Gwynedd were automatically enrolled in one of these companies. Any Quakers that mustered were disowned by the Friends during the monthly meetings. On June 19, 1778 as Washington left Valley Forge headed to New Jersey and General Smallwood had breakfast, the entire army passed through Gwynedd, and many encamped here overnight. General Washington was escorted by fifty "Life Guard" with drawn swords. It must have been quite a sight to behold as they marched on to their grim business. Home of historian Howard M. Jenkins. 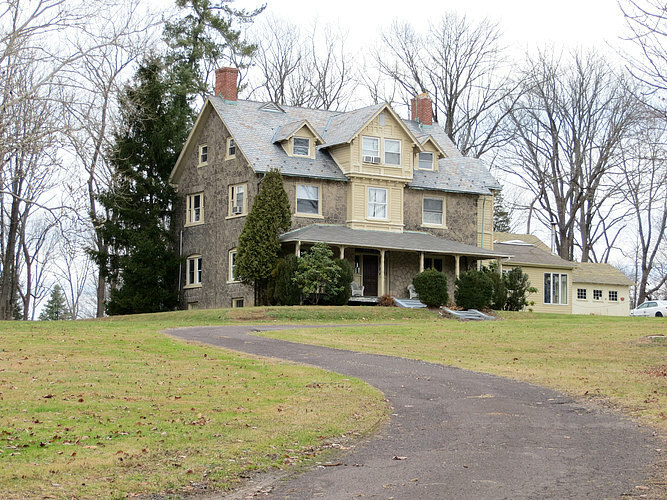 Built at the top of a hill, the ground slopes away for miles in three directions. From here, he could see the Gwynedd Friends Meeting House from his front door and the Meredith house from his back door. Gwynedd Friends Meeting House. December 2014. 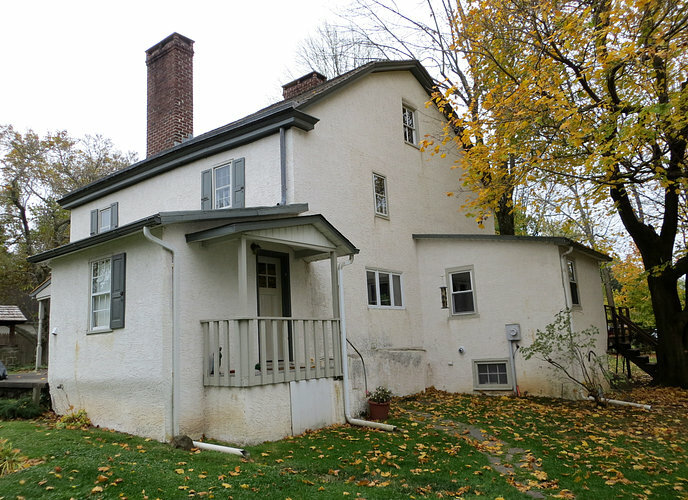 This building, built in 1823, replaced an earlier stone and log structure that was built in 1712, which replaced an even earlier log structure that was built in 1700. To build the first 1700 meeting house, 62 Friends contributed financially. Owen gave 4 pounds, 8 shillings. The first two ministers of the Meeting House were Robert and Cadwallader Evans, Owen's uncles. They were Episcopalians who became Friends after Cadwallader stopped at the Meetinghouse on the way to Robert's house "to see how the Quakers do." Owen Evans, Mary Nicholas Evans, Rebecca Evans, Dr. Joseph Meredith and his family are all buried in the Gwynedd Meeting burial grounds. The locations of the Evans graves are not known. 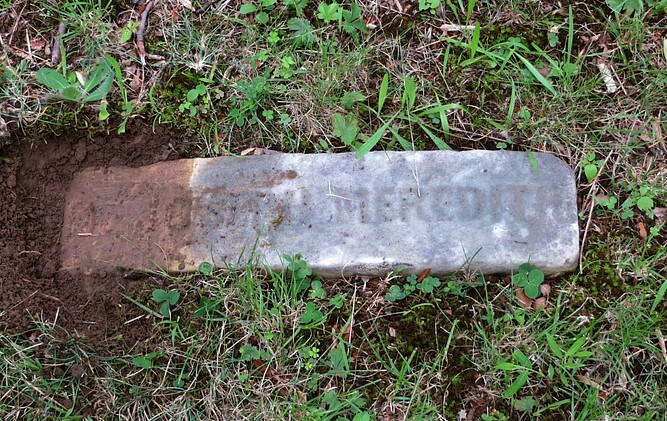 Only 10 to 20 percent of the older graves are marked. Also buried here, in unmarked graves, are about 50 Revolutionary War soldiers. Howard Jenkins is buried at Upper Dublin Friends Meeting burial ground. 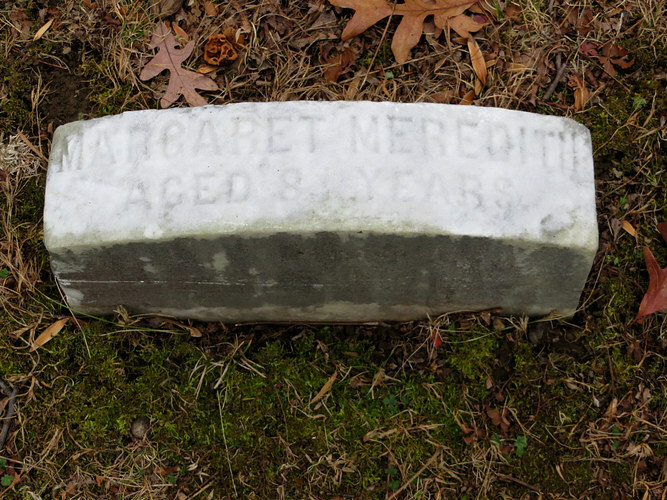 Final resting place of Joseph and Margaret Meredith.